Amazon.com offers the Koogeek Wi-Fi Enabled 2 in 1 Smart Plug Compatible with Alexa and Google Assistant for $14.99 via coupon code 6WCL3EJT . The smart plug is designed with 2 built-in AC outlets. Each plug has its respective ON/OFF switches. Connect it to a 2.4GHz Wi-Fi and you can separately control connected devices by using Koogeek Life app. You can remotely control and monitor connected devices with the free Koogeek Life app whether you are at home or not. Reduce energy consumption and electricity bills. Compatible with iOS 8.0 or Android 4.4 or later devices. 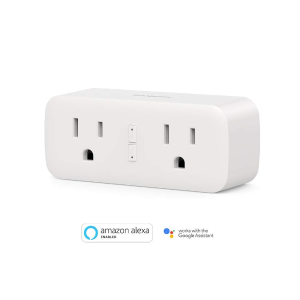 Both AC plugs work with Amazon Alexa and the Google Assistant. You can use your voice to ask Amazon Echo or Google Home to turn connected devices on or off after configuration. Set timers or countdowns to turn the connected device on or off at a preset time. You can set up the connected devices turned on or turn off times according to your needs. You can use the Koogeek Life app to monitor the current and voltage of your plug-in devices and provides real-time reports on how much energy your devices are consuming. Use the Smart Plug to monitor how much a refrigerator is costing you, or how much energy a particular room consumes.